Bangalore ranks third among 14 other metropolitan cities in India in terms of overall aggregated emission and energy use from urban commute. How can this be checked? C40 Air Quality Network, a collective of 14 cities across the world, with Bengaluru and London leading the initiative, was officially launched on July 30. Deputy Chief Minister G. Parameshwara inaugurated the event to mark the beginning of a global discussion to tackle and share knowledge regarding the steps taken to handle air-pollution. The Deputy Mayor of London, Shirley Rodrigues, listed out measures she intends to implement in the British capital. Imposing toxicity charges on polluting vehicles, and adhering to UK and European air pollution limits are among the measures she spoke of. 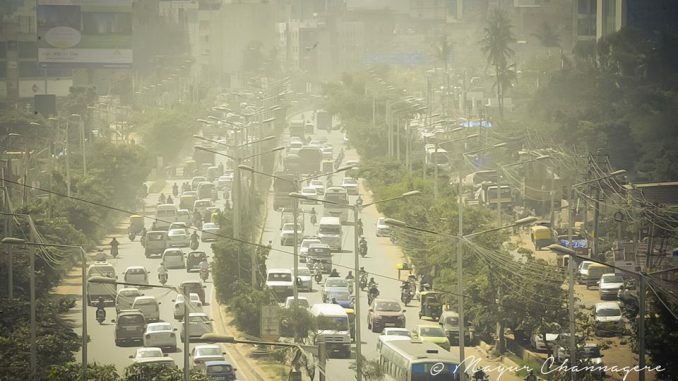 The BBMP announced plans of its own for Bengaluru – Rs 20 crore to be invested in censors to monitor particulate matter, and real time digital display of air-pollution levels. As an after thought, Parameshwara is contemplating introducing methanol and CNG together as an environment-friendly option in comparison to petrol and diesel vehicles. When the 110 villages across five constituencies on the outskirts of the city became a part of BBMP limits in 2007, there were nearly 220 unique settlements and gram panchayats in this area. Fast forward to ten years later: the study by World Resources Institute (WRI) reveals that 28% of the villages ceased to exist independently, having merged with urban slums. The strain on resources is caused by the increasing number of migrants, and preferential treatment shown by authorities to the core areas that are prioritised in urban development agendas. Gram panchayats were able to administer and run the villages better with more focused governance. Open defecation, and infrequent public transport are some of the problems that need to be addressed, says the study. The councilors representing localities on the periphery were keen on BBMP splitting into three sub-corporations for equitable distribution of resources without class distinction, according to V. Ravichander, a member of the (now disbanded) BBMP Restructuring Committee. At a meeting held with various stakeholders to consider the pros and cons of the elevated corridor proposal, CM HD Kumaraswamy assured reporters the project will not go forward if the public is opposed to it. His reasoning for the re-introduction of the proposal was to find a solution to traffic congestion, while helping commuters travel easily. Public Works Department (PWD) Minister H.D. Revanna was also present during the meeting. He said that a consensus will be arrived at once an Environmental Impact Assessment (EIA) was completed, and after studying public concerns. To put this into effect, BBMP and BDA have asked for a Detailed Project Report. Bengaluru East was subject to a special drive conducted to check vehicle violations recently. The result: 1062 school vehicles, and 1301 water tankers, almost half of which were heavy goods vehicles, were booked. Assistant Commissioner of Police Kasim Raja pointed out a road safety program for children where school buses without insurance and required permits were at the receiving end of the unexpected crackdown. Heavy goods vehicles with objects sticking out dangerously, was also a cause for concern, he said. 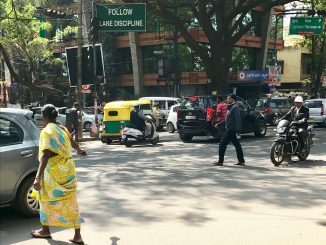 On August 1, Chief Justice of Karnataka High Court Dinesh Maheshwari gave the BBMP a few hours before the afternoon session to act on an order concerning illegal hoardings. The BBMP Commissioner represented by lawyer V Sreenidhi communicated the civic body’s compliance and immediacy in removing 5000 illegal hoardings by 2:30 pm on the same day. The instruction was instigated by a Public Interest Litigation (PIL) that was up for hearing soon. Post the removal, the hearing has been rescheduled to August 8. The BBMP in its defense highlighted the 94,000 illegal hoardings that were removed over the last four years. Acting on public complaints, the BBMP approached Chief Secretary TM Vijay Bhaskar, who helped coordinate a meeting between the civic body and the traffic police, to kickstart resumption of the white topping of key roads in the city. The traffic police had help up clearances for the work, citing their inability to divert traffic during rush hours on high density roads, especially Outer Ring Road. Additional Commissioner ( Traffic) R Hitendra was also concerned about unfilled edges causing accidents and made it clear that this needed to be addressed. For now, the work has resumed in full swing on the stretches where work had been pending for months. Other roads identified for resumption of work, according to The Deccan Herald are: Hebbal to Hennur, Nayandahalli Junction to Sumanahalli, Rajkumar Samadhi to Sumanahalli and West of Chord road. The corporate entity to implement the suburban railway project, K-RIDE (Railway Infrastructure Development Company Karnataka Limited), is 48% owned by a private firm, Infrastructure Development Corporation Karnataka Limited (iDeCK ), while the Indian Railways and Karnataka government own 26% each. However, the suburban rail policy announced in 2017 said that the state must be the primary owner of the SPV. A State government official said the process to change the ownership pattern of the SPV had already been initiated. In the past, similar SPVs have been formed but to no avail. A recent article by Citizen Matters throws light on a Special Purpose Vehicle already in existence since 2014. It was set up by a company registered in the name of Bengaluru Suburban Rail Company Limited (BSRCL) with a capital of Rs 50, 00,000, under the urban development department.